How did the American Otto Warmbier Actually Die? On 10 October 2018, several American doctors, who were involved in caring for and treating the fairly well-known Otto Warmbier, confirmed the theory, proposed by the student’s parents, that Otto’s teeth and gums looked as if they had been cut with a saw, and as a result, the US citizen had died from torture inflicted on him. This “medical conclusion” was sent to a court in Washington. In response, on 27 October, the Head Doctor at a Pyongyang hospital reminded the public that US doctors, who took part in repatriating the student, gave the North Korean side a medical note stating that at the time of transfer he was in normal state of health. The doctor also referred to an article in the American newspaper USA Today from 21 June 2017, which mentioned the fact that a neuropathologist from the US University of Cincinnati carried out a medical examination of Warmbier, and confirmed absence of any signs of starvation or physical abuse, either in the form of fractures or damage to internal organs. 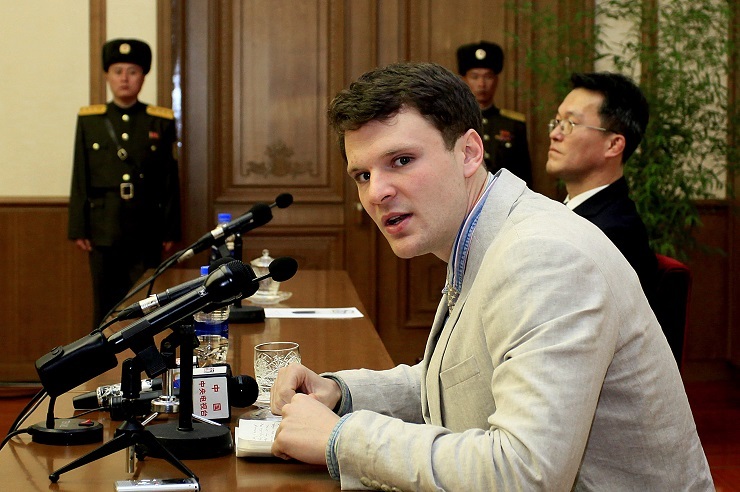 In addition, the doctor said that, according to the report by the US network NBC from 27 September 2017, an expert, who conducted the autopsy on Warmbier’s body, also did not find any signs of torture, and an examination by forensic odontologists indicated there was no evidence of any trauma to the teeth. However, if we distance ourselves from yet another attempt by grieving parents to find culprits, responsible for the death of their son, among the North Korean authorities, a very sad picture begins to emerge. Based on Warmbier’s symptoms, it seems very likely that the young man died from after effects of a stroke, or a serious problem with circulation in the brain, which had gone unnoticed, and the treatment, he had received, was not of good quality. This, of course, is connected to the overall state of North Korean medicine, as it is one of the sectors most affected by imposed sanctions. As far back as 10 February 2017, the United Nations Office for the Coordination of Humanitarian Affairs (UN OCHA) labelled DPRK as state with “forgotten crises”, where inhabitants live in crisis situations, in need of actual aid. And the media does not write about this, and discussions about these issues are lacking in political circles. It was reported that 60 % of North Koreans lack food, a quarter of the population do not have access to basic medical services, and 1.7 million North Korean children are in danger of contracting deadly diseases. In the meantime, in 2016, less than 40% of funds required for humanitarian aid to DPRK was raised. And to continue with the narrative, we should note that with the worsening North Korean nuclear crisis, shortage of supplies only grew, and dual-use products applied in medicine remained in the list of sanctioned goods. However, the so-called life expectancy of North Korean citizens continued to rise, as illustrated by the data from the United Nations Population Fund (UNFPA). Life expectancy for males was 68 years, which is 1 year more than the previous year, while that for females remained the same at 75 years (in South Korea, to compare, the equivalent measures were 79 and 85 years, respectively). The average rate of population growth in DPRK since 2010 was 0.5% (in comparison with the global measure of 1.2 %). On 6 February 2018, after a UN meeting on North Korea sanctions, the Ambassador of the Russian Federation to DPRK, Alexander Matsegora, told journalists that the humanitarian crisis in North Korea is worsening due to sanctions. He said that it was almost impossible to deliver humanitarian aid, including food provisions, to poor North Korean inhabitants, and requested that humanitarian agencies receive help in delivering food supplies, drugs and medical equipment. Alexander Matsegora also highlighted the problem of treating female patients with cancer,since due to sanctions, a designated medical facility in Pyongyang was unable to receive equipment deliveries, and as a result, women were dying. On 13 February, the International Federation of Red Cross and Red Crescent Societies made a decision to allocate $320,000 for preventing the spread of a new influenza virus sub-type H1N1 in DPRK. These funds were spent on protecting the integrity of the state medical system, after influenza symptoms were found in 178,000 residents, and 4 people died in the period from December 2017 to 23 January 2018. We can also review the report of the UN Special Rapporteur on the situation of human rights in DPRK, S/72/394. Even it expressed concern that sanctions could hinder cancer patients’ access to vital chemotherapy medication. In May 2018, the Eugene Bell Foundation, which focuses on the project to treat multidrug-resistant tuberculosis, sent a delegation to DPRK and a delivery of drugs, which can be used to treat 2,000 people for 6 months. Employees of the Eugene Bell Foundation visited 12 local centers for treating multidrug-resistant tuberculosis, and met with medical personnel and patients. On 13 April, the station Radio Free Asia once again broadcast an update on fund raising activities connected to the humanitarian aid efforts. The United Nations needs $111 million of aid for the food and public health services sectors in DPRK. Last year, the allotted budget amounted to $114 million. But due to sanctions, not more than 30% of the required funds was collected. In July 2018, the UN Deputy Secretary-General for Humanitarian Affairs Mark Loukok came to DPRK. During his visit, Mark Loukok inspected clinics, kindergartens, and a baby-food manufacturing plant; and held negotiations with state officials and humanitarian aid partners. On completion of the visit, Mark Loukok noted that over 50% of the children, who live in the countryside, do not have access to clean water, while 20% of the children are malnourished and hospitals do not have enough medication. The UN Deputy Secretary-General pointed out that the hospital, which he had paid a visit to, houses 140 tuberculosis patients, but only 40 of them had received necessary drugs. According to his statement, in order to provide humanitarian aid to North Korea, the UN has raised $110 million. On 5 October, the World Health Organization included DPRK in the list of 30 countries with the highest tuberculosis rates. In 2017, DPRK was home to 130,000 patients suffering from tuberculosis, which included 5,200 patients with multidrug-resistant tuberculosis. Hence, disease prevalence in DPRK is equivalent to 513 per 100,000 people (which puts it in 5th place after Lesotho, South Africa, the Philippines and Mozambique). In DPRK the death rate from tuberculosis is 63 in 100,000 people, which places it fourth after Mozambique, the Central African Republic and Angola. It should be noted that over the space of a year, the situation in DPRK substantially deteriorated. To fight tuberculosis this year, North Korea needs $84 million, but it is yet to raise 92% of this amount. On 9 October, Kim Song, the North Korean ambassador to the UN, pointed out that the sanctions, imposed by the UN Security Council, seriously infringe on North Korean citizens’ rights to life and development. He highlighted that these sanctions prohibit transportation of medication and X-Ray equipment that North Korean women and children need. On 23 October 2018, the UN Special Rapporteur on the situation of human rights in North Korea, Tomás Ojea Quintana, referred to testimonies by defectors from North Korea by saying that normal North Korean inhabitants were starving and had no access to medical services due to lack of money. However, limited availability of medical services results in a situation, in which patients’ earnings become an important variable. On 16 November, upon their return from another long trip to North Korea, employees of the Eugene Bell Foundation held a press conference and called on the South Korean leadership to participate in resolving the DPRK issue. According to their statement, further work to combat tuberculosis in DPRK is in jeopardy, because in June, international aid aimed at purchasing drugs had stopped. Hence, there is a current lack of medication for treating new and existing patients, in the meantime, annually 130,000 new cases are diagnosed in DPRK, and last year 8,000 patients with multidrug-resistant tuberculosis were registered. In addition, the sanctions against North Korea have led to problems with building special quarantine bays for those suffering from tuberculosis. As a result, the Fund has asked the South Korean government for assistance, and has requested that the UN Security Council Sanctions Committee on North Korea lift sanctions on operations connected to combatting tuberculosis. And on 4 December, the committee published a list of approved goods for delivery to DPRK, as part of humanitarian aid for the treatment of multidrug-resistant tuberculosis. The list includes 280 drugs and pieces of medical equipment, and also gives a detailed description of consumables for medical personnel, such as instant ramen noodles, coffee and other supplies. On 20 November, the South Korean Institute for Health and Social Affairs brought more depressing facts to light, using statistics from the World Health Organization for 2017. North Korea’s maternal mortality rate was 82 deaths per 100,000 live births, which is approximately eight times higher than the equivalent statistics for South Korea. The infant and toddler mortality rate in DPRK, for children up to 5 years of age, was equivalent to 24 deaths per 1000 people, which is 8 times higher than that in South Korea.
. Forty to 60 % of medical facilities lack drugs such as pain killers and antibiotics. Clearly, some things are being done to change this situation for the better. The Korean Central News Agency periodically broadcasts reports about Kim Jong-un’s visits to new medical facilities or pharmaceutical plants that are being built. Additional efforts are being made to develop traditional medicine in DPRK. And there are even rumors about new crops of opium poppies being planted in mountainous regions, which should not be treated as a discussion about a state-sponsored narcotics operation, but as an attempt to use this crop in production of pain killers. On 7 November 2018, South and North Koreas held their first negotiations on issues related to public health, and agreed to begin a pilot project, aimed at exchanging information about infectious diseases, and developing cooperation in the medical and public health spheres in the long-term and mid-term. Still, by and large, it is clear that due to the policy of sanctions, the nation is not being supplied with either novel drugs or new medical equipment, which greatly affects the country’s health and well being. Unfortunately, as in many other regions, it is not a priority to supply prisons with medical supplies, which is what caused the US student to fall into a coma.